There are a lot of reasons why a boatbuilder will reintroduce an existing model. Most of them have to do with cost savings. Reusing hull molds and adding a few cosmetic changes is a good way to launch a “new” model, the newness of which is sometimes for marketing purposes only. That said, there are other reasons to refresh a classic: namely when the original design served its purpose so effectively that large changes were unnecessary. 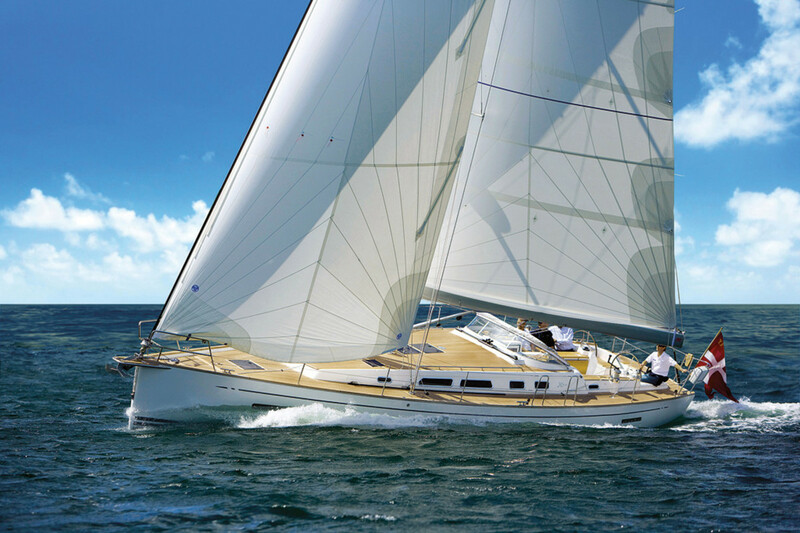 Such is the case with the Xc 45 “Next Generation,” a classic cruiser from Danish builder X-Yachts. Approximately 200 of the original model were sold in Europe, so it only made sense to update what was also a strong design to appeal to today’s sailors, while retaining the boat’s performance and ocean-crossing capabilities. X-Yachts builds three lines—the Xp performance line, and the X and Xc cruising lines—and the difference is not in name alone. The Xc yachts, for example, have deeper hull sections for more interior volume to accommodate more tankage and stowage for extended cruising. Their V-ed hulls are also more sea-kindly, especially when sailed to weather, and the heavier displacement allows for a bigger, L-shaped keelm, while an integral steel frame spreads the loads from the keel-stepped rig. All heavy equipment, like tanks and batteries, is mounted deep in the hull to lower the center of gravity and make the yachts less tender. 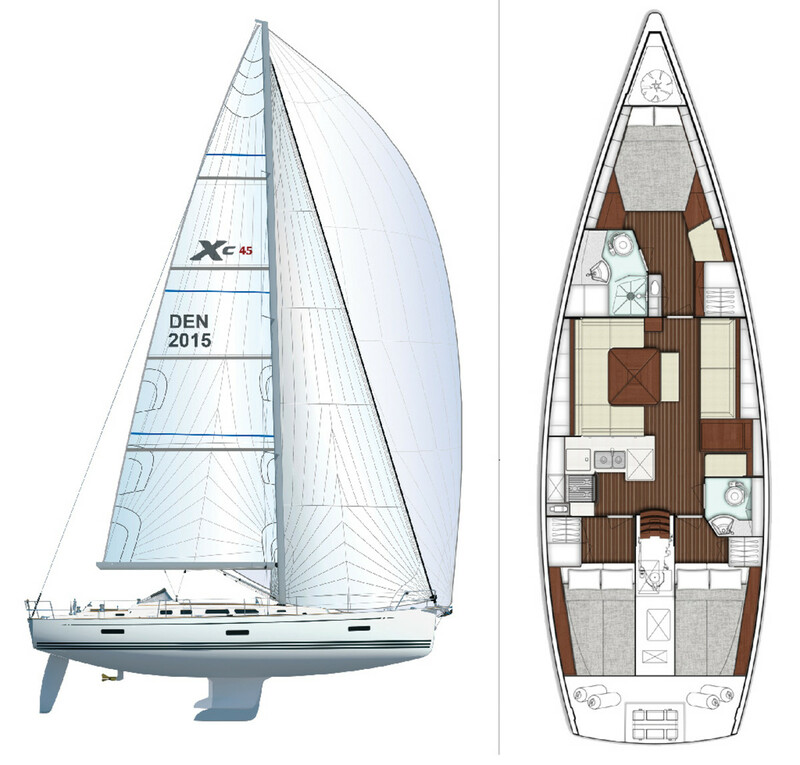 X-Yachts introduced the Xc 45—the first of its then new Xc line—in 2007. The cored sandwich construction provided stiffness and a moderate displacement of just under 30,000lb. Some weight savings (about 400lb) were achieved in the revamp, and that weight made its way to the keel for greater stability. Today, the keel draws just over 7ft. A shoal keel that draws nearly 2ft less is also available for those who frequent shallow cruising grounds. By today’s standards, the Xc45 has a narrow cockpit, known traditionally as an “oceangoing cockpit,” but that’s what makes the boat practical offshore. The drop-leaf centerline table is straddled by two benches and is good not only for al fresco dining, but for serving as a sturdy foot brace when heeled over. There is a bit of a pinch-point between the twin wheels and the table, but the general layout is safe and manageable. Access to the large drop-down swim platform (which is now larger than on the original model) in the traditionally raked transom is via a lift-up section in the cockpit coaming aft. The 9/10th fractional rig supports triple aft-swept spreaders and a total sail area of 1,135ft² with a 94 percent self-tacking jib. Another possibility is to opt for a larger genoa (108 percent or 140 percent) and a small working jib on a furler to maximize sailplan versatility. An optional sprit is available as an attachment point for an asymmetrical spinnaker that adds nearly 2,000ft² of downwind sail area. Rod rigging comes standard. There is a split backstay. All lines are led aft under the deck. Andersen halyard and reefing winches and an array of Spinlock rope clutches sit on the cabintop, astride the companionway. The X-Yachts trademark windshield serves as an excellent connecting point for a full dodger and provides a bit of protection from spray. Our test boat was fully coated in teak, including the standard teak on the cockpit, and the optional teak on the decks and cabintop. The Xc 45 layout places the master stateroom in the bow and two guest cabins aft, with an option of having a one cabin aft and a lazarette. The owner’s stateroom has a center island berth, a small seat, hanging lockers and an en suite head with a separate stall shower and a Jabsco electric head. Stowage was added throughout the boat as part of the re-design, and there are drawers under the master berth. The traditional saloon now enjoys more light and air thanks to the opening side portlights that were enlarged in the revamp. A C-shaped settee is to port and wraps around a table. A seat on centerline completes dinner seating for six, while a straight settee to starboard adds lounge space and makes for a nice sea berth when equipped with a lee cloth. Good handholds run along each side of the cabintop just below the ports, so that they will be within reach for tall and short alike—an essential item on offshore passages. [The galley to port is L-shaped and generously proportioned with plenty of countertop space bordered by fiddles integrated into the Corian. The Eno three-burner stove will do nicely when cooking for a crowd, and there is a top-loading fridge/freezer combination as well as a front-loading fridge. The forward-facing nav desk is to starboard and in my opinion, is a must on a real cruising boat. However, another option is to add a stall shower in the aft head, which eliminates the nav desk and instead provides two seats with a small table to starboard. I suspect most cruising couples will go with the real nav desk and use the shower in the forward stateroom. The finish on our boat was a light teak with a visible horizontal grain pattern. The white headliner, upholstery and trim lightened up the interior and brought it up to date. 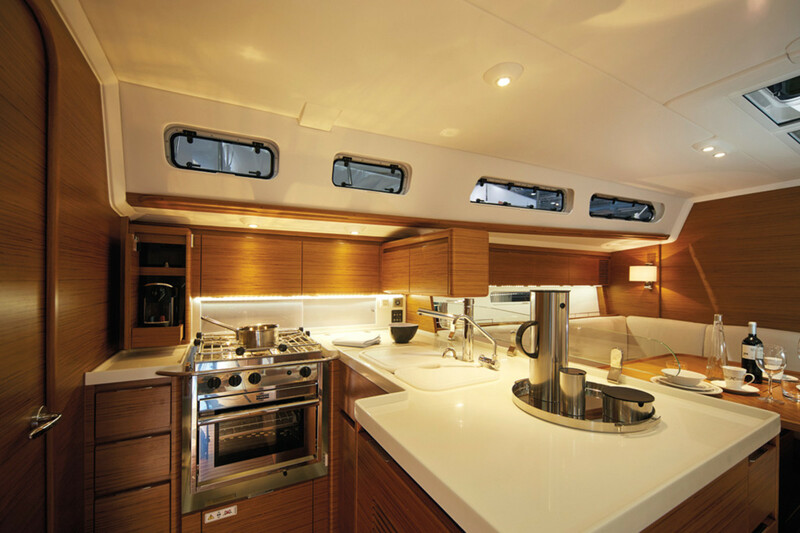 Twin overhead hatches in the saloon have further increased light and ventilation below, in keeping with modern cruising boat design. We tested the Xc 45 in ideal conditions on Chesapeake Bay, with flat water and a steady 14 to 16 knots of wind. We also had a suit of Quantum membrane sails and the optional furling boom for the mainsail. Because we enjoyed such a nice breeze, the Xc 45 was really in her element, producing 8.3 knots at a 45 degree apparent wind angle and 8.0 knots at 30 degrees off the wind. Our highest speed was 8.6 knots at 60 degrees, which fell off to a still impressive 8.1 knots on a broad reach. The boat showed signs of foregivness no matter who was on the helm. She kept her speed up through the tacks, accelerated noticeably after turns and generally moved as smoothly as a luxury car with only a light touch on the helm. Bottom line: like the original Xc 45 and, indeed, the entire X-Yachts line, the Xc 45 “Next Generation” is an absolute joy to sail. Auxiliary power is provided by a 75hp Yanmar diesel. On flat water we motored back to the slip at 8.5 knots at 3,000 rpm. Although Raymarine and B&G instruments are at both helms, engine controls and the optional bow thruster are only to starboard. Tankage is respectable for offshore cruising, with 116 gallons of fuel and 162 gallons of freshwater. X-Yachts tapped its owners for feedback on the updated version of this popular couple’s yacht, freshening the brand and bringing it up to date. The changes are slight, as if the boat had “a little work done” at the spa, but given the success of this already very capable bluewater cruiser, why mess with success?